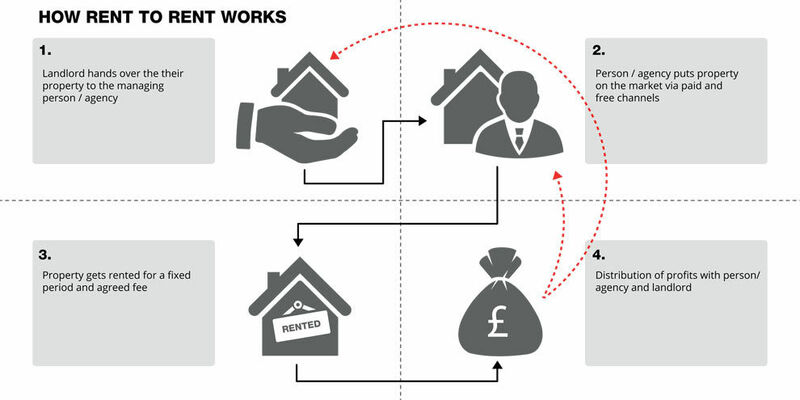 What is Rent to Rent and how does it work? Without confusing Guaranteed Rent where the whole property is paid for by a qualified estate agent for a fixed period, covering all voids, repairs, maintenance and legal cases. Rent to Rent (as seen on) is where an individual or a company rents a particular property from landlords where the Landlord receives a fixed guaranteed rent. This form of subletting is perfect legal and there are several ways to legally sublet a property, usually involving commercial or corporate tenancies, management agreements, and leases or guaranteed rent schemes. This is a very attractive scheme that appeals to landlords, main simple reason being is majority of landlords want a hands-off investment while the renter looks after the property, both physically and legally. At the heart of ‘rent to rent’ lies the biggest question of, are landlords actually aware of what their tenants are up to? We feel only a few are. Most AST (assured short-hold tenancy) agreements specifically do exclude sub-letting without prior consent from the Landlord. With Rent to Rent there are added risks, it is vital that landlord insurance also covers such risks. HMOs are generally never covered on a standard landlord policy which would lead to any claims being declined. Many insurance companies will also insist on a Rent to Rent agreement as an AST between the landlord and tenants/occupants and the insurance will also specify that there is no subletting. The long and the short of it is anything outside of the Normal process of letting a property could invalid your insurance, now imagine you have a claim for a fire and your insurance is invalid. So is Rent to Rent a legal form of sub-letting? Actually yes, it is, provided the council (some multi-let properties will fall under a HMO definition and require a licence. If the property requires a license but isn’t, it’s the landlord, who could find themselves in court and not the rent to renter) mortgage lender is informed, the necessary insurance cover is in place and in many if not some cases, the standards required for an HMO are in place. A quick way of making good money can possibly turn into a landlord’s nightmare, other issues can arise if the rent-to-renter decides to do a moonlit flit with the rent money. When there is no real direct contract between the landlord and the tenants living in a property, an eviction process will be a nightmare for all concerned. An even worse scenario is when the landlord lets a property to someone they believe is a normal tenant, but who actually goes on to divide and sub-let the property. Normally the first the landlord finds out about who’s really living in their property is when the rent money stops turning up or the neighbours complain about the noise from 10 people crammed into a three-bed flat. Rent to Rent also puts the landlord into difficulty due to immigration checks required by law in tenants. Fines of up to £3,000 per tenant will not be taken too easily by any landlord due to their lazy attitude seeking a hands off investment. This is where 62 landlords have been fined since legislation regarding checks have come into effect. Rent to Rent business can be tricky. Entrepreneurs and homeowners who are considering taking part in ‘Rent-to-Rent’ must check all legal implications with a solicitor. It also important to note that Sub-letting a property under an AST can and will often breach the terms of a Buy-to-Let mortgage, most times leaving the owner and middleman vulnerable to situations such as repossessions and effectively invalidating landlord insurance. During these situations the Rent-to-Renter can offer different type of tenancy agreements to the landlord, such as corporate or commercial tenancy agreements, a management agreement, lease or guaranteed rent scheme. What landlords need to be aware of is that a commercial tenancy agreement is subject to different laws than a standard residential tenancy. Under the terms of an AST agreement, the landlord has the right to evict tenants once the term expires, but not in a commercial tenancy where the renter has the right to demand a new tenancy. If the homeowner is unfortunate, they could very well lose control of their property to an unscrupulous middleman who is just out there to make an extra income without much care and consideration. Looking for that “middle man” It is very important to develop good relationships with agents and the owners of rental properties in your area in order to find the best properties to rent and to make sure they come to you first. Contracts that are watertight will benefit all and to know what you can negotiate and also how to correctly negotiate with property owners and eventually factor in the costs of repair works that the property needs to be done for it to be ready. Rent to Rent is a mainstream strategy whereby you can create a really great cash-flow – and fast, most new businesses that don’t survive fail due to poor cash-flow, so this is of vital importance. The homeowner gets complete peace of mind and will be happy that his problems have all gone away now that he has a guaranteed income, even if the property is not occupied.